In last month's article I wrote about 5 aspects of sales that I've noticed clients struggling with. This month, I'm going to apply these categories to an analysis of a recent positive sales experience I had. I think we can all find examples of bad salesmanship, but my hope is that seeing these traits done well in a real life contexts will be even more informative. Just to up the ante, I'm going to use a example that always gets picked on: the used car salesman. In January I bought a new-to-me car. I come from very frugal bloodlines, so you might have caught sight of me tooting around town in my 1996 Honda Accord. I loved that car, but seeing as it's as old as the legal drinking age, it's unsurprising that my shop informed me back in November that it was on its last legs. I know of precisely one car salesman in my network, Ezra, so naturally I reached out to him for guidance when my car was given it's prognosis. Ezra gave me an insider tip: since I had some flexibility about "when" he recommending we touch base in January after the holiday trade-ins had all happened to see what they had in stock. I hadn't shopped for a car in over a decade, so I anticipated a rather long process of learning and deliberating, but at least now I had a starting point! I knew nothing about modern vehicles, which became apparent when Ezra asked me what my must have features were. "Reliability" I said. "Great, we'll only put you in reliable vehicles then! Is there anything else, especially in the 'nice to have' category?" "Working air conditioning" I said. "Yes, ok, we can definitely do that... anything else though?" I had no idea. Suffice it to say that there was a lot of room for Ezra to "raise awareness" of the features available in modern cars. This fact was readily apparent to Ezra, so when he put me in the first car he took the time to highlight all the features. Push button this, and auto that, and all these other features that I had no idea were ever invented in the first place. I could have easily bought a car that didn't have all those features, but it was important information for my later purchasing decision to know what features were out there, and assess and compare the vehicles I was considering. Raising awareness isn't just about "up selling" the customer, it's also about empowering them to make an informed buying decision. From the very start, Ezra was streamlining my purchasing process by offering guidance on when to buy. But also at the dealership he did a lot to streamline by focusing only on cars that made sense for me. He never showed me a car I couldn't afford (and he did the math about tax, title, etc. to ensure this.) When I asked about car's I'd come to fancy he told me about how they compared to what he was showing me, and explained why what he was showing me was more suitable for the preferences I'd mentioned, but we didn't bother test driving them. The last car purchasing experience I had, I definitely got caught up on trying to buy the most car for my money. Ezra actually served a very important role of keeping me true to what I'd said at the beginning, and not letting me get lost in all the options that exist. Streamlining isn't about fast tracking the customer towards a purchase, it's about accurately understanding what the customer is seeking, providing that thing, and then reinforcing how that really is the choice that fits their needs. It turns out Ezra is a master at reflecting and I really needed that skill in this instance. After my first test drive we went back to his office, and he checked what else was in stock, but nothing was really jumping out as a good fit for me. That first test drive had a lot of bells and whistles that I didn't need. It felt like driving a spaceship compared to my old car, which felt magical but also didn't seem very true to my frugal heritage. I sat there stuck. Ezra looked at me. Then he reflected: "It seems like you liked that car?" "Yes" I said with much hesitation. I was so conflicted. I had no idea what the road forward looked like. "So then what's preventing you on moving forward with that vehicle?" He inquired expertly navigating my hesitation. "Well, I can't really buy the first car I test drive... can I? I mean, what if I regret it later?!" That truth I hadn't even realized myself before it tumbled out of my mouth. He spotted the problem. I needed a point of comparison; I needed to know why that car was actually the best car. This conversation I could not have navigated on my own. 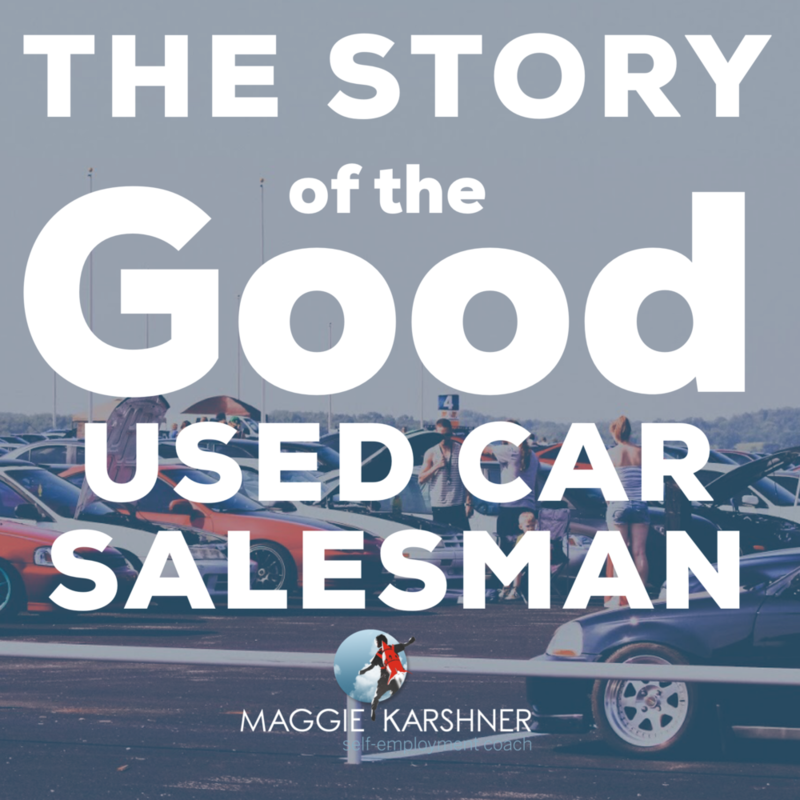 As the salesman, Ezra was key to helping me understand my own purchasing process, and it felt like a relief to have that guidance. So, naturally, he solved the problem. There was a car within my parameters at another location which he'd originally nixed because he didn't think I'd love it, but it would give me some point for comparison. It was a brand and model I had positive associations with, so I was excited to try it out! Off we schlepped to the other location. The moment I sat in that car I was less excited. It didn't feel like a spaceship, but it did feel exactly how I'd expected my new car to feel. It had all the pragmatic aspects, and none of the flair. When we got done with that test drive I was even more conflicted. Ezra reflected, "you seemed less excited about that one." I hadn't actually realized, but yes, I was less excited. He wasn't inventing the truth, he was just making an accurate observation which I hadn't noticed. The epitome of reflecting. But reflecting alone doesn't make the sale happen. In this purchasing journey reflecting often pairs with removing barriers. After I confirmed that I was less excited by the second one, I launched into weighing pros and cons. After an exhaustive evaluation the decision was still not clear. Now my brain was dizzy with all those factors, stunned that I might be leaving with a car *today* and about to go over the cliff into unproductive "what if's." I'm not sure if Ezra could see that cliff looming, but he intervened none the less, "So it seems like you prefer the first car over the second one?" "Yes." I answered simply. It was, in fact, what the pro-con conversation had clearly revealed. An excellent reflection on Ezra's part. I paused more or less stunned. "Well, I guess I just didn't think I'd buy a car on my first trip out. I thought this would at least take weeks." Ezra reassured me that he gets this a lot, and it's totally normal and he feels his objective as the salesperson is to make it pain free and easy. "Oh," I said. He had removed all possible barriers to the decision. It took me some more moments of processing and disbelief, but that was it, the decision was more or less made. I had questions about what the purchasing process looked like, how / how much I'd pay today, and when I'd actually take control of the car, but the decision was made. Underpinning all these interactions was the trust that comes from working with a personal friend. I know where he lives, so if he does me wrong... well, I'm not sure what I'd do but I would know where to find him! But there were also things he was doing that reinforced rather than eroded this trust. He acknowledged and honored my preferences when streamlining, respected my journey by reflecting truthfully, and was knowledgeable when removing barriers. If any of these things had not been true, I would have started to trust him less as a salesman and the end result would not have been the same. If you'd like to have a similarly lovely car buying experience, feel free to connect with Ezra Shively at Carter Subaru/Volkswagen. You can reach him directly via phone and text at (206)659-9502.